Additional Info: Dermatofibrosarcoma protuberans classically has one of two patterns of invasion into the subcutaneous fat. 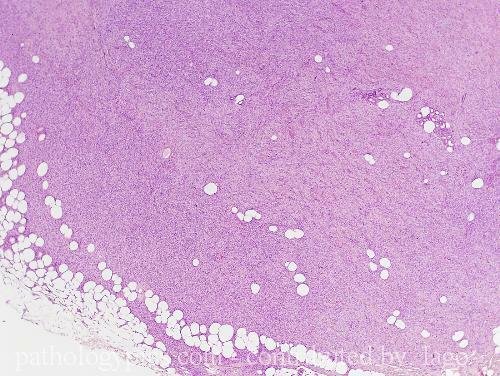 One pattern is a relatively even layering of fibrous tissue/tumor that penetrates parallel to the surface (shown above). The other pattern is diffuse infiltration along the septae of the adipocytes. Mixed patterns can be seen. Dermatofibroma, specifically, the deep penetrating variant, can interface with the surrounding fat but this is usually a smooth, well circumscribed boundary, as seen in the deep DF (see folder). When DF’s do extend into the fat, it is not extensive and the extensions usually radiate outward focally, like spokes on a wheel.